Low mapping rate 4 - Bacterial contamination in reagents — What do you mean "heterogeneity"? The large amount of amplification needed to get usable material from single cells cause us to get detectable signal from minor effects such as ribosomal RNA or TSO concatemers. This also means reagents need to be particularly pure. Several studies have inviestigated the bacterial contents in kits used for sequencing studies, investigating the 'kitome'. Reagents might have a small amount of contamination which will not be detectable in the "bulk" assays with more input material it was designed for, or even for relatively large single cells. The thread contains more examples good vs bad lots of reagents. They also reported which lots they had had success or failure with. For the data analyzed in the previous posts of the series, SuperScript II has also been used, though I don't know the lot number. The company producing SuperScript II later acknowledged a couple of lots where contamination of E. coli had beed detected. Analysing the reads from my data, I didn't see contribution from E. coli, however, I did find contamination from Pseudomonas. This bacterial family have also been reported in papers describing reagent contamination. I added sequences for Pseudomonas 16S and 23S to the Salmon reference, reran the samples, and compared the results to the previous iteration. With this addition the mapping rate for the majority of the cells jump up to ~75%! From the scatter plot above we can see that before adding the Pseudomonas sequences, the mapping rate was more heterogenous. As we did before, we can see if this relates to the individual plates. 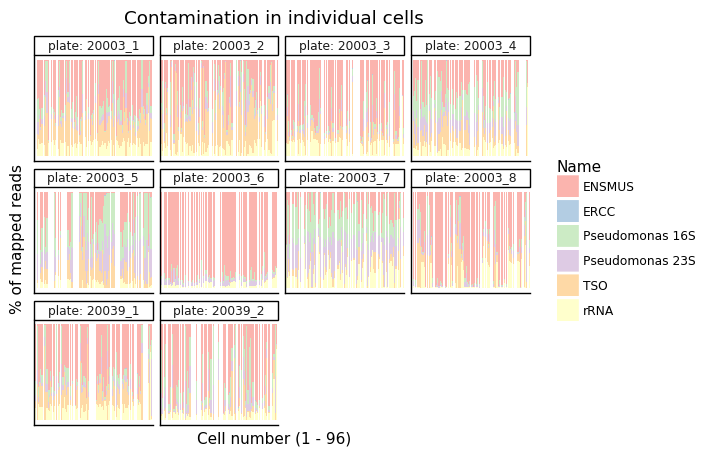 It is quite interesting that some plates have a larger contribution of TSO concatemers while others have larger contributions of bacterial sequences. All these plates are suppowed to have the same lots of reagents. However, the plates are sorted on different days then stored in a freezer until the experiment is done. It might be the case that TSO products and bacterial products degrade differently due to this.